2648 and 2644 West Grand Blvd. Not long after the Tamla release, Berry and Raynoma knew they would need to move again, but this time to their own premises which could also double as a studio with a proper control room. Anyway, the cost of leasing studio time was not insignificant and it made a lot of sense. In July 1959, Raynoma came across a photographer's building on West Grand Boulevard which was owned by Gene LeVett. On 2nd August the building changed hands. What would follow, would be one of the greatest success stories in the history of popular music. In the company's hey day the staff would use the right hand door of the Hitsville building, and the owners, Berry and Ray, the left hand door. The latter, was to access the upstairs living quarters. Behind the large ground floor window was the main reception area. To it's left was the telephone exchange. The control room was towards the centre of the building and the studio on the lower ground floor, at the rear. In 1985, the building became a museum under the directorship of Berry's sister, Esther Gordy Edwards. Today's museum entrance is number 2644/6 (on the right of this picture). This was once the offices of the Jobete Music Publishing Company. 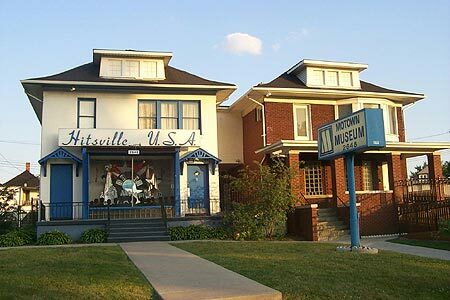 To enter Hitsville is to achieve a lifetime ambition.